An often-used common name for this fungus, the "jelly ear," is very appropriate—a rarity with common names in English. One look at this fungus and you can see why people think Auricularia americana looks like the missing part of a Van Gogh self portrait. Appearing on the wood of hardwoods or conifers, especially after rains or in wet conditions, the jelly ear ranges from disc-shaped to ear-shaped to irregular and floppy. Its surfaces are brown to reddish brown, and the consistency of the flesh is rubbery and gelatinous. When young and fresh, its underside appears frosted with a whitish dusting, but this often disappears quickly. 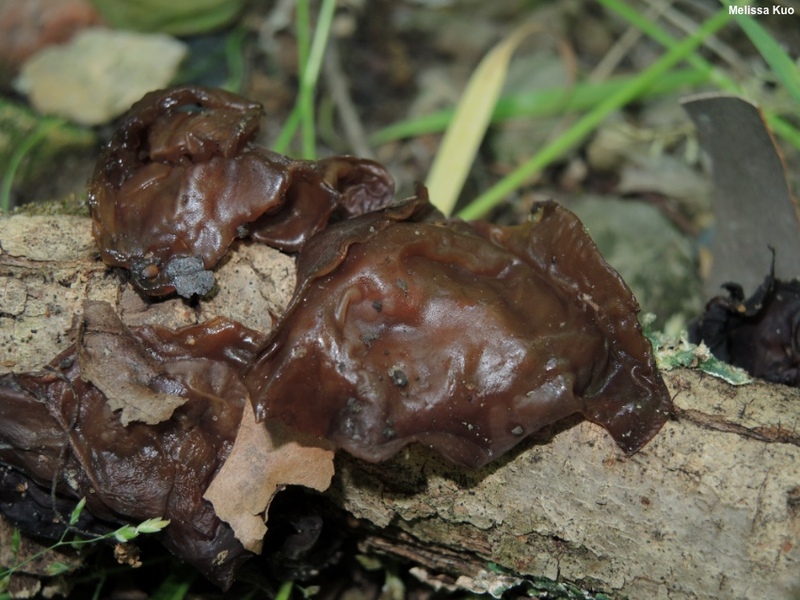 Similar jelly fungi include Exidia recisa, which features ridged, concave depressions, and Tremella foliacea, which is a bit more gelatinous and appears like a tightly packed cluster of jelly ears that are fused together. 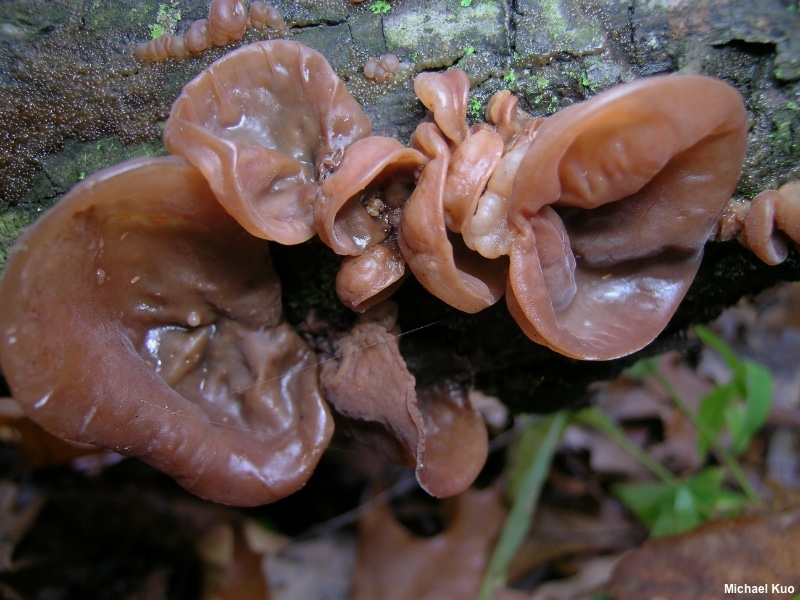 In the southeastern United States, Auricularia fuscosuccinea is virtually identical, to the naked eye, but differs microscopically (see discussion below). The names Auricularia auricula and Auricularia auricula-judae have been traditionally applied to the mushrooms described here, but fairly recent research (Looney and collaborators 2013, Wu and collaborators 2015) has determined that the auricula-like North American species of Auricularia are not properly placed under those species names. 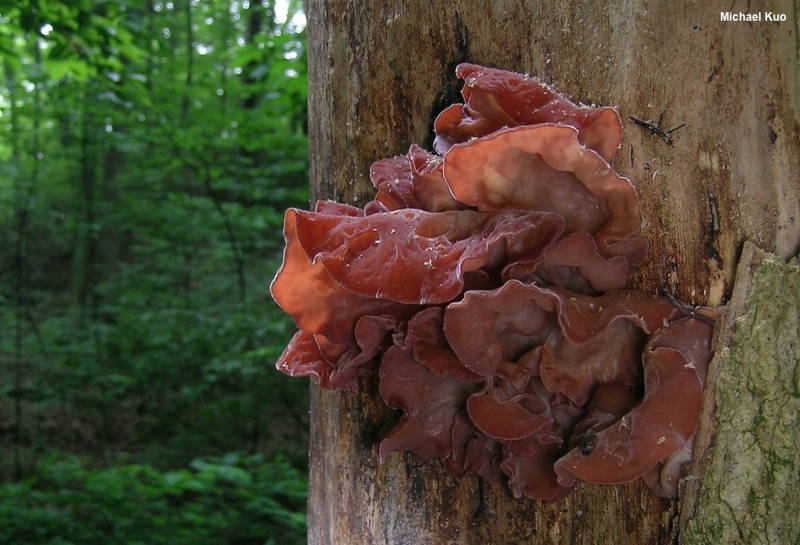 Instead, we have several genetically distinct species, including: Auricularia americana in the strict sense, which grows on the wood of conifers and, under the microscope, has no medullary zone; Auricularia fuscosuccinea, which grows on the wood of hardwoods in the southeastern United States and has a distinct medullary zone; and a species—the one described here—that grows on the wood of hardwoods and has no medullary zone. 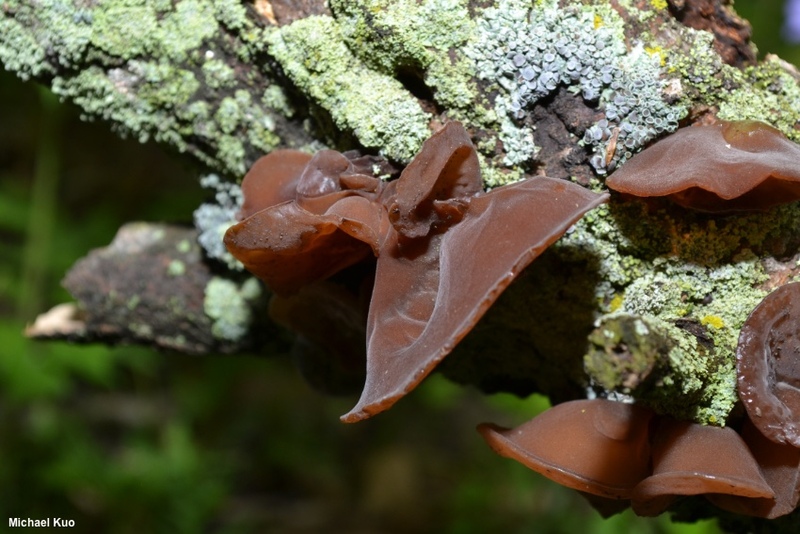 Wu and collaborators (2015) attempted to name this third species "Auricularia angiospermarum." However, the Wu publication did not include the correct Mycobank number in the original description of the species, and the name is therefore officially invalid. Contemporary taxonomic rules require that authors of new species register their names in an online database (Mycobank or Index Fungorum) and obtain a corresponding identifier from the database; Wu and collaborators appear to have done so, but then failed to use the correct number in their publication. In short, the fungus described and illustrated here has no "good" name at the moment, so I have applied the name "Auricularia americana," with quote marks around it, until the mess is corrected by a taxonomist. This approach follows the 2013 approach of Looney and collaborators, who called both the species described here and the conifer-loving species Auricularia americana, separating the two types as "deciduous unit" and "coniferous unit" on the basis of a previous study by Duncan & Macdonald (1967). Ecology: Saprobic on decaying hardwood sticks, logs, and stumps; spring, summer, and fall; distribution in North America uncertain, since the species has previously been folded in with others as "auricula" or "auricula-judae." The illustrated and described collections are from Illinois. Fruiting Body: Wavy and irregular; often more or less ear-shaped but sometimes oval, elliptical, fan-shaped, cup-shaped, or irregular in outline; 2–5 cm across; thin; usually gathered together and attached at a central or lateral position; upper, fertile surface brown to reddish brown, bald, sometimes wrinkled in places; lower, sterile surface finely hairy when fresh and young, creating a whitish bloom over the brown to reddish brown surface; flesh thin, gelatinous-rubbery; entire fruiting body becoming hard and black when dried out. 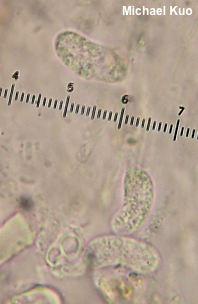 Microscopic Features: Spores 12–14 x 4–5.5 µm; allantoid; smooth; hyaline in KOH. Basidia 65–75 x 4–5 µm; cylindric; filled with semi-refractive oil droplets; transversely 3-septate; difficult to isolate in a mount due to a gelatinous matrix; sterigmata difficult to locate. 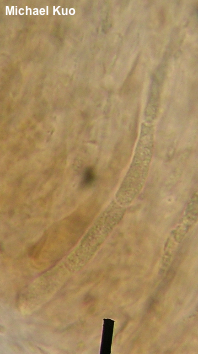 Flesh composed of scattered, poorly defined, gelatinized hyphae 2–3 µm wide; medullary zone not differentiated. 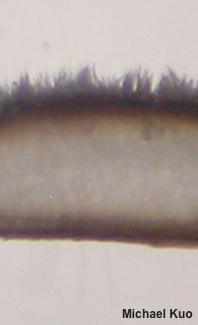 Abhymenial surface with projecting hyaline hairs 40–125 x 7.5–12.5 µm; cylindric-fusiform; walls 2–3 µm thick; smooth; hyaline to golden in KOH. REFERENCES: Parmasto & I. Parmasto, 1987. ("Auricularia auricula": Smith, 1949; Duncan & Macdonald, 1967; Lowy, 1971; Smith, 1975; Smith, Smith & Weber, 1981; Weber & Smith, 1985; Arora, 1986; States, 1990; Phillips, 1991/2005; Lincoff, 1992; Metzler & Metzler, 1992; Horn, Kay & Abel, 1993; Barron, 1999; Roody, 2003; McNeil, 2006; Miller & Miller, 2006; Kuo, 2007; Binion et al., 2008; Kuo & Methven, 2010; Evenson, 2015. 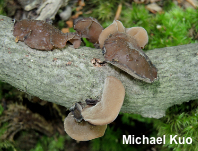 Auricularia americana: Looney et al. 2013; Woehrel & Light, 2017. 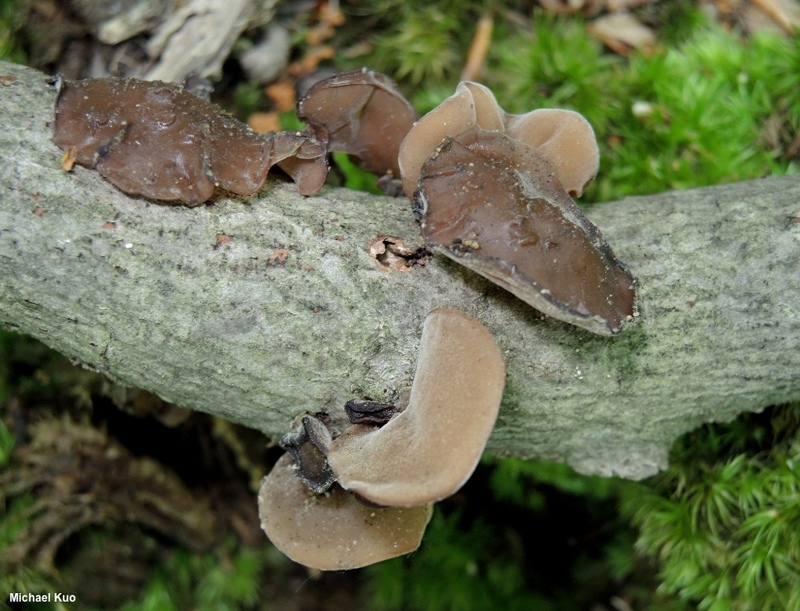 Auricularia "angiospermarum": Dai et al. 2015.) Herb. Kuo 05099501, 06130203, 04270702, 05261702, 05261802.